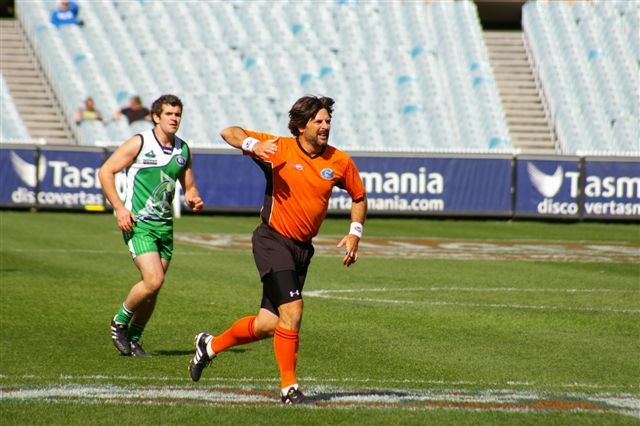 ​Jeff is the current USAFL Umpire Coach and has served in this role since 2011. Jeff was the first international umpire to attend and umpire at the AFL International Cup in 2002, and has been involved as both a player (2008) and umpire (2002. 2005, and 2011) having umpired two International Cup Grand Finals (2005 and 2011). Jeff started playing footy with the Nashville Kangaroos in 2000 and has played over 150 games for his club. He started his umpiring career in 2001 and has more than 300 total games and 30 international games to his credit. He served on the Kangaroos bard for 12 years, including 5 as president. Jeff lives in Nashville, TN and travels extensively for work andvacation, having been to 49 states and 19 countries. He currently works for Xerox Business Services. He is known for doing the New York Times crossword in ink and and is a movie and theater buff. No Replies to "Jeff Persson"